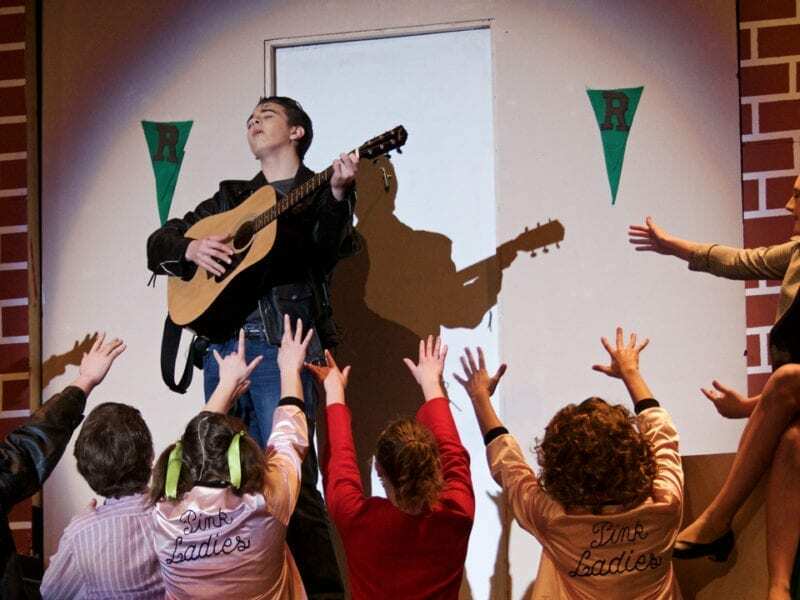 With outstanding performances from Miles Kasten as Danny Zuko and Summer Tonneson as Sandy Dumbrowski in the lead, Grease at First Flight High School was everything the musical is supposed to be. Grease is not easy to produce or perform. It’s all about the singing, it’s all about the dancing and the look and the feel of that last year in high school. And this production hit all the right notes and made all the right steps. Somehow through all the contortions of teenage angst, broken relationships, miscommunication between the sexes and everything else that goes into life at Rydell High, the sense of innocence and optimism that is teenage life shines through. The play is a joyous romp that follows the twists and turns of the lives of the students of Rydell High, 1959, opening with Eugene Florcyzk (Travis Lawrence), the class nerd welcoming everyone back to a new year, trying so hard to be cool and say the right things. And failing miserably. Yet as uncomfortable as his scene is, it is nothing compared to the moment when Danny Zuko realizes the summer romance he had with Sandy may not be over. 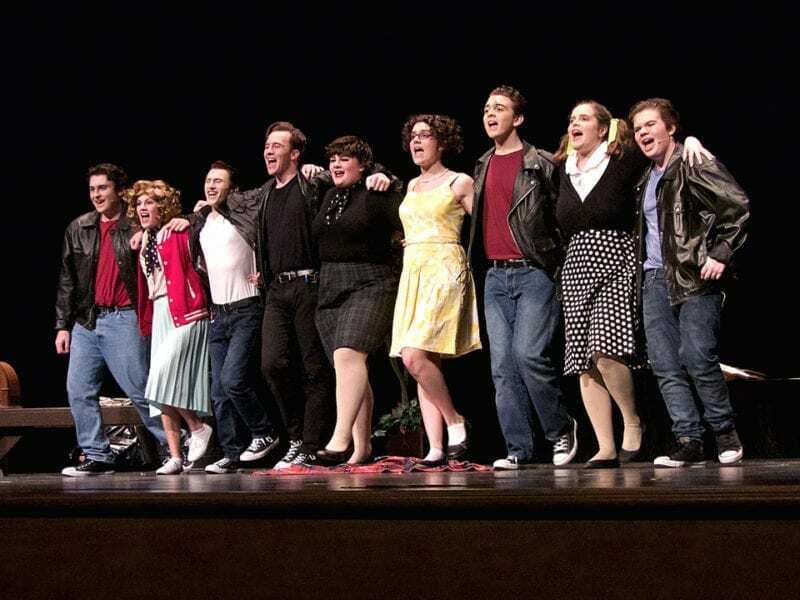 Danny is the leader of the T-birds, the coolest gang at Rydell High. Sandy, new to Rydell, is taken in by the Pink Ladies—the most “in” female clique around. 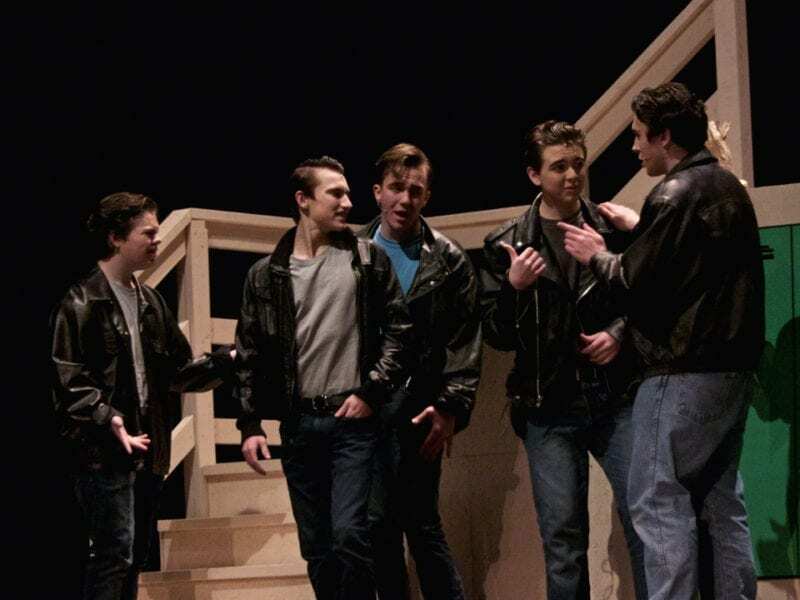 The conversation in both groups turns to what happened over the summer and tale Sandy and Danny tell introduces the audience to two versions of the same story. “He was sweet, just turned eighteen,” Sandy sings. “Well, she was good, you know what I mean,” Danny tells the T-birds. Then they see each other and in one of the most uncomfortable meetings ever written into a script the audience discovers that Danny told her he was going to a private school and Sandy’s father refused to enroll her at Immaculata, the local Catholic School, when the Mother Superior said patent leather shoes were not allowed. “Well she said the boys could see up my dress in the reflection,” Sandy tells the Pink Ladies. 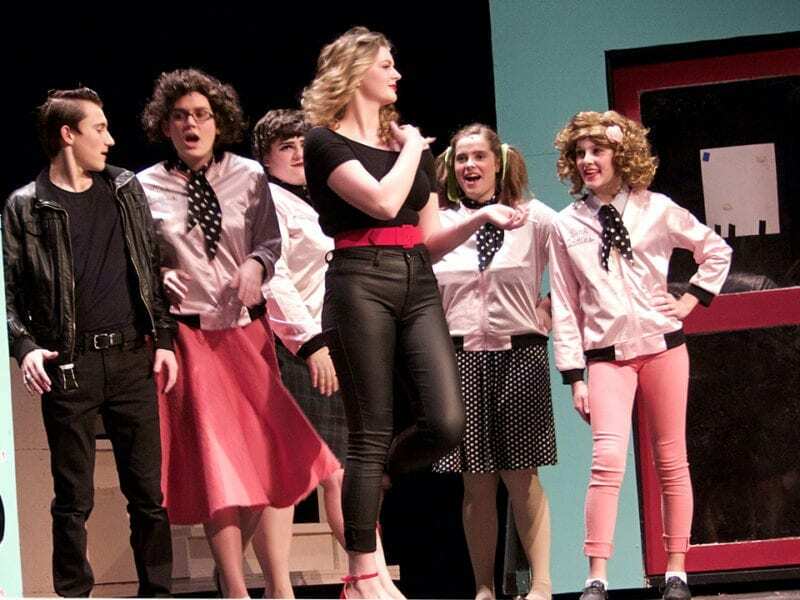 The scene sets the story for almost everything that follows, and it is at the core of why Grease still plays well, even though much of the way relationships and life is seen seems at odds with 21st century views. 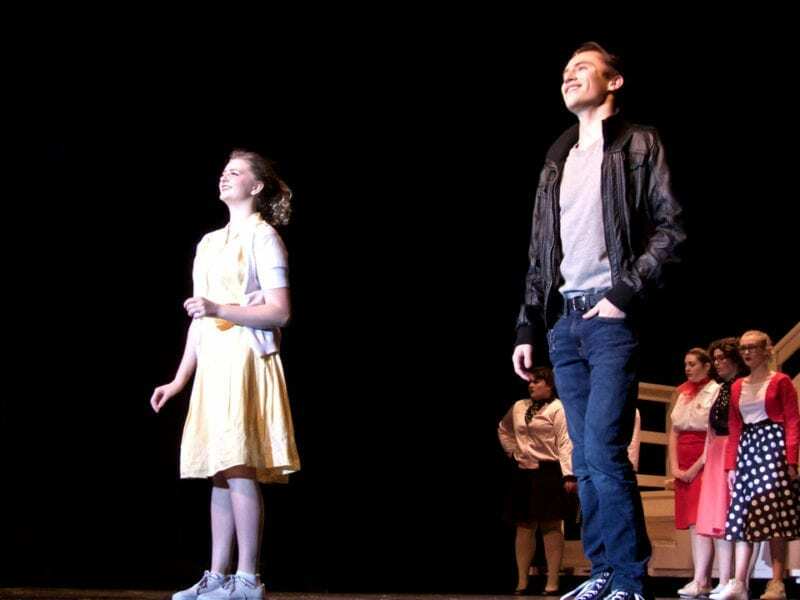 Yet if the play centers around clearly defined roles for boys and girls or men and women that was a part of life in the 1950s, what keeps Grease relevant is the struggle of the kids to understand what their role in life will be. Frenchy (Amber Laskowski), one of the Pink Ladies, hopes to be a beautician, and drops out of school to follow her dream. Then reality sets in and she flunks out of beauty school. Wonderfully choreographed and performed, her Guardian Angel’s advice is succinct. “Turn in your teasing comb and go back to school,” he croons. 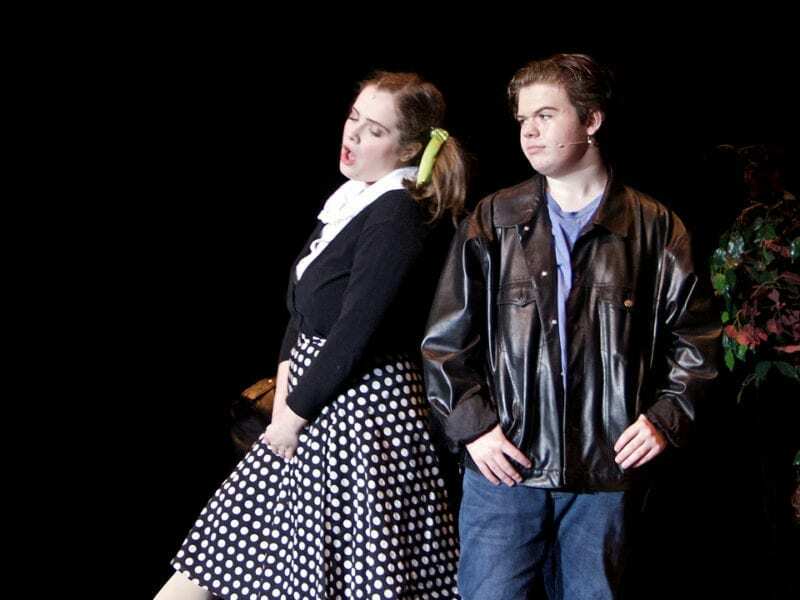 As Danny and Sandy blunder through the wilderness of teenage romance, their ordeal stands in contrast to the relationship developing between Roger “I’m the King of the Mooners” (Jonathon Davis) and Pink Lady Jan (Suzanne Harrison). “I even mooned old Lady Lynch once, right out the car window…” he tells her. “Oh, I wish I’d been there,” she replies. 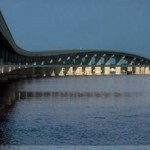 What follows is a beautifully sung duet that is at once sweet and funny. Perhaps, though, the most powerful message comes from Betty Rizzo (Kierstan Lewis). Hard-bitten and trash-talking, Rizzo’s take no prisoners approach to life, marks her as the titular leader of the Pink Ladies. She doesn’t pity others and she certainly doesn’t seem to pity herself. She tells the Pink Ladies her “friend” is five weeks overdue and she thinks she’s pregnant—she’s not as it turns out, but that is revealed later. Her sometime boyfriend, Kenickie (Joey McNamara), overhears the confession and he confronts her. “Hey, listen, why didn’t you tell me?” he asks. “Don’t worry about it Kenickie. You don’t even know who the guy is,” she says, dismissing his concern. Rizzo does admit later that if she had been pregnant, it would have been Kenickie. Everyone leaves and Rizzo is alone on stage and Lewis’ interpretation of the song “The Worst Thing I Could Do” was exquisite and flawless. Lewis gives Rizzo’s character a harsh voice, loud and brash. But when she sings her voice, although still powerful, is soft, wishful, perhaps winsome, and it brings out perfectly the person she hides. 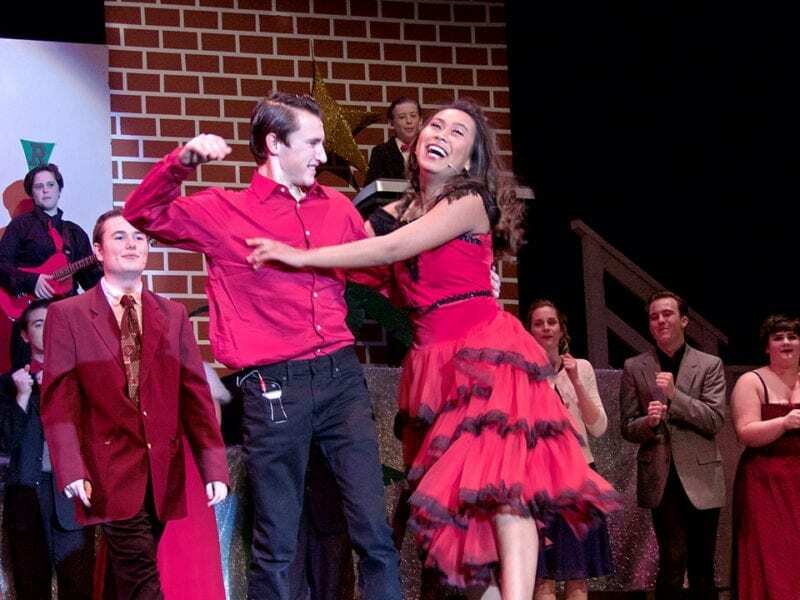 That type of performance is what the audience looks for in a play and that is what made this performance at First Flight High School a triumph of musical theater. It is unfortunate that every performance and every name cannot be called out. This was consistently a consistently excellent production without a weak moment.